In an attempt to put some numbers behind the common moan that the UK Government's target of '2 Mbps for all' is not ambitious enough we ran a poll asking visitors what speed they think should be guaranteeed as part of the Universal Service Commitment. The result indicates that the vast majority of people view the 2 Mbps target as being far too slow, and the fact that the same question asked in 2009 resulted in similar results, shows how out of touch policy-makers are with what users expect from broadband services. 31.9% of those responding to the poll voted for 20 Mbps to be the guaranteed speed in 2015. The poll received over 2,400 responses, and as the graphic above shows the spread of choices is very similar to three years ago. There has been a small shift towards people wanting the guaranteed speed to be faster, but given that around 28% of UK households have access to FTTC via Openreach, and 48% of the UK have access to the 30/60/100 Mbps services from Virgin Media, one might have expected an even higher level of expectation. The full results and percentages from the poll are on our broadband blog. 75% responded that they would change broadband provider to get a service that met their desired speed, though they were not necessarily prepared to spend a significant amount more each month to do so, with over a third not willing to spend any more. The answer from the public seems to be clear—those areas where only the basic 2 Mbps USC will be met will be viewed as still behind the times, and the USC target date is exactly three years away. Some local authorities may manage to provide speeds better than 2 Mbps to those in the final 10% of UK households, but the desire for speed is clear. There has been a small almost unannounced shift in the superfast broadband targets for BDUK projects promoting the 'faster than 24 Mbps' target for 90% of users which the EU is talking about. The National Broadband Scheme document (dated 20th March 2012) now states that projects must target speeds of 30 Mbps or more as the definition of 'superfast'. 3All new projects must target delivery of superfast broadband speeds of 30 Mbps or more, which is in line with the EU's superfast/NGA broadband targets. However, due to earlier UK definitions of superfast referring to speeds of more than 24 Mbps, projects already underway will be satisfying the superfast broadband speed requirement if they seek to deliver speeds of more than 24 Mbps." It is expected that the 'basic' 2 Mbps broadband services should cost no more than £100 to install and the recurring cost should not exceed £25 per month to ensure that the service is truly accessible. This of course is significantly more than some of the cheapest broadband services available in cities today. I voted 4Mbp/s USC with up to £2.50 and yes to change. It seems a little unrealistic that people would ask for anything above 8Mbp/s as a USC. Rural communities and island communities will require alternative technologies in many cases, and the costs of these at high speeds will be excessive. Perhaps the polled should be asked their current speed when giving their opinion on their preferred USC. Someone I know is getting 1.5 Meg and is approx 4.5km from their exchange. They appreciate the reality of the situation. What speeds would he consider great? 2 Meg of course. I would be interested in hearing the reason why the people who responded to the survey want a guaranteed speed of 20Mbps? Many people only use the internet for email, banking and shopping so would not benefit from that speed. I consistently get over 3Mbps and I'm really happy with it. Is it a case of 'if it's technically possible then I want it'? How many homes are full of gadgets that were bought because they were available and are never used? Speaking as someone without BB via copper I can assure you that I would like to use the internet for a lot more than email and shopping. Lovefilm, cloud services, iPlayer, 4OD, programme updates that don't take 24 hours to download,Skype (to speak to my children), video calls (the same) etc etc just doesn't cut it on a 1mb 3G connection. As we only have this chance to improve the situation via BDUK, as much capacity needs to be built into the system as possible for future proofing. I think part of the argument is that, although many people only use the internet for basic purposes there are plenty of people who want a lot more from it. Just because they happen to live in a small town or village doesn't mean they only want email. Besides, the internet is an ever evolving monster, it's important to think ahead - 2meg may be reasonable for today, but by 2015 will it be enough? In my house we have 4 desktops, 3 laptops, 2 Xboxes, a PS3, 5 smart phones. And 5 people. I get BB at 0.75. Now I need 20. I am sure you agree. You cannot do what we want to do on less. Houses dont just have 1 person living in them. Remember the word family its the key here. Why should I not want to use iplayer on 3 different PCs at the same time without interruption. Its available to do but i have to have the speeds to do it. And I am only guessing at 20 as clearly I dont have the chance to try it out. "shows how out of touch policy-makers are with what users expect" - doesn't it actually show how out of touch users expectations are with reality more than anything? Pretty much. The government makes unrealistic policy targets. The consumers make unrealistic demands. The wholesaler supplies unrealistic speeds. Welcome to the UK. Unrealistic broadband since 2000. I live in a market-1 area. It's the upload I find pathetic for the things 'andylock' listed. BT could double our upload with current tech which would improve usability in a multi user/gadget households. @woodsmanUK Guessing you have a 448Kbps upstream. ADSL from BT Wholesale has a 832Kbps upstream product (£5 per month extra), but not many providers offer it. Also gives slightly better priority at peak times. I think the upstream product is £7.83 extra (Plusnet's version is, at least). I think I voted for 8Mb/s. I agree that a USC of 20Mb/s is unrealistic. Certainly is when you consider that no-one wants to pay any more than what they are already. I voted not to pay more for double the speed - I get 1Mb/s on a good day so why should I pay more for a speed that most people in this country would still consider laughably and unusably slow? @andygegg:It's because you are harder to provide for. That means to get you the same service as people such as myself requires that your telephone line have more money spent on it than mine. If you were upgraded to my level of service I'd then be entitled to ask why you are so special. For the money spent on getting you FTTC I could probably have FTTP. It's geography and the laws of physics. You are getting the best that human technology can provide for the price you are prepared to pay. Put another way:You're paying for effort. If we both have a budget of £20 then I can pay to have a parcel couriered to me from London because I'm only 50 miles away. It will arrive within two hours. If you live in the Scottish Highlands you will struggle to get that same parcel delivered. If it's even possible for that money it sure won't arrive within two hours. That's no-one's fault. Just the way the universe is. '...That means to get you the same service as people such as myself requires that your telephone line have more money spent on it than mine'. Have you got any data that supports this often quoted view? I find it hard to believe that my Exchange with about 400 lines costs more to maintain than some of these huge City exchanges with many thousands of lines. I know it seems intuitive because the copper has to go much further in rural areas but is there any proof it costs more. As I have stated in the past, OR did their first 'maintenance' on my line in 30 years last year. BTW - I voted for 40Mbps and I'm prepared to pay more for it - up to the cost of my now defunct Sky contract - £70 per month. The trouble is Andrue C the same could be said for water and electricity, and the good old analogue phone (sic). Broadband sits in this grey area where it's neither a utility nor a commercial product, with elements of both. With all Europe probably going the way of Geece faster than we think (especially UK) I don't think the government can afford to throw money around in the way it's doing, but I see no chance of any of us living within our means any time soon. We all have too many "rights" but no responsibility. Poll was tarded, didn't give an option to have no USC at all. @mervyl:Water and electricity are considered more important, yes. However they do actually suffer from the same kinds of limitations. It's just that you're not usually aware of it because people can't swamp them as easily. If people in the village and a town started turning their water taps on or firing up every electrical appliance the village population would run into a problem sooner than the town population. @Philcoates:It isn't just about running costs - although economies of scale work in favour of towns so /per line/ the cost will be lower in towns. If a given area has 10 faults a day and half of them are in the town then those five can be fixed more quickly and cheaper than the other five because the engineer only has to potter around town. Faults in villages can result in engineers have to drive several miles between jobs. But it's upgrading where the cost difference really shows. It's cheaper to upgrade a cabinet in a town because you get far more bang for your buck. A town cabinet might only have 10% take up of FTTC but if a town cabinet serves 1,000 lines that's 100 properties covering the install cost. Some villages don't even have a 100 properties to start off with so even if they get 100% takeup they might not be profitable. It's going to depend on the relative cost of smaller v. larger cabinets of course. But basically you've got two choices here:Either every telecommunications provider in the country hates you or else there is a economic reason why you don't have faster broadband. Given the recent issues that affected NextgenUs I'd say it was pretty obvious what the answer is. 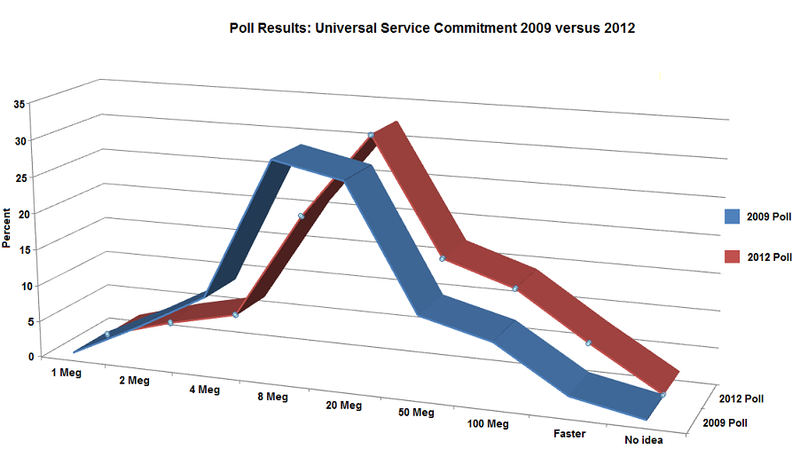 Shock, users of a broadband fan site vote for faster speeds for all! ^ This, not exactly a representative demographic. I understand the logic of the arguement. What I was asking for is some concrete evidence that rural exchanges cost more than urban ones. Like a lot of often quoted stuff, there is no factual basis to it.